IDJ: During 1948 and 1949 there was immense turmoil in China as the Nationalist and Communist factions battled for control of the country. Events were moving towards a climax. As a result, the Chinese airlines CNAC (China National Aviation Corporation), CAT (Civil Air Transport) both with Sino-American interests and flight crews, and Central Air Transport (nationalist government owned) all based in Shanghai, were increasingly using Kai Tak airport as a safe haven well away from the ever changing disruptions to air travel throughout China. CAT in particular was heavily involved with moving Nationalist troops to where they were needed in ground war battles. This company and CNAC were soon returning to evacuate dispirited soldiers along with the inevitable civilian refugees. As the civil war closed in on Shanghai, the airlines moved their fleets and valuable assets of spare parts, tools and equipment to Hong Kong. When the communists finally won control over most of China, these airline fleets and many of their staff had escaped to Hong Kong. CNAC in particular then set about creating a major aero engineering facility at Kai Tak airport to service its large fleet of airliners and freight aircraft, and attempt to carry on flying regional services. Subsequently, long drawn out legal disputes arose as to who owned these aircraft at Kai Tak and their related equipment. The new government in China claimed they were theirs as the airlines had been majority owned by the previous government, and must be returned. Those holding the aircraft in Hong Kong claimed that they were theirs as most had been donated or purchased via the American stakeholders in CNAC and CAT. After a number of Chinese pilots and engineers with communist leanings absconded to China with some of the aircraft, the fleets were grounded by removing parts of their wings and critical components so they could no longer be flown. They were placed under guard and the airport had around 70 Chinese aircraft parked up and immobile while the ownership case dragged on through the courts. Meanwhile, the British government was increasingly concerned by the communist forces massing near Hong Kong’s border and ordered Royal Air Force reinforcements to fly up from Singapore. Using these as an excuse for urgently needed more space on the congested airport and to get rid of the troublesome presence of the Chinese airlines, the Hong Kong government gave the “owners” now primarily represented by the Americans, one month’s notice to get their workshops and facilities off the Kai Tak site. With very large stocks of tools, spare engines and related equipment weighing many hundreds of tons, the task was not an easy one. 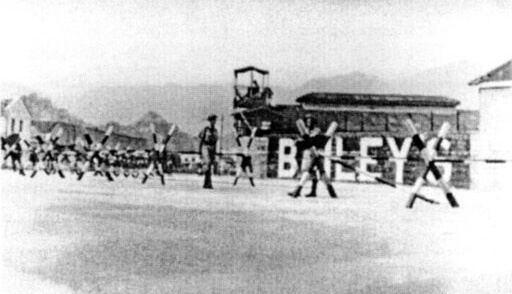 CNAC however managed to purchase the British owned Bailey’s dockyard about a mile from Kai Tak to use at its base and storehouse. CAT initially moved its equipment into a chemical factory in nearby To Kwa Wan and then by landing-craft barges (LST) fitted out as a workshops and spare parts stores to Taiwan. In 1952, the long drawn out court case awarded ownership of the aircraft at Kai Tak to the Americans who quickly shipped them out by sea to the USA including on the decks of navy aircraft carriers. Meanwhile, under their noses, the now un-paid CNAC employees with communist sympathies were despatching by sea from Bailey’s dockyard to north China the airline’s spare parts, tools and engines. 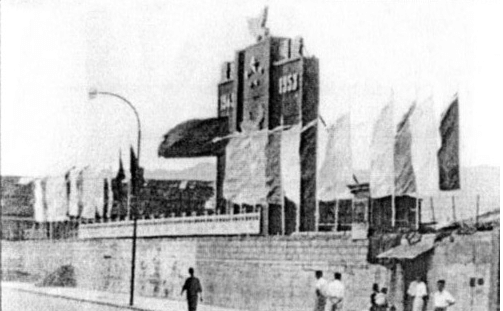 Over the next few years the dockyard became a hotbed of communist activity with many demonstrations and conflicts with the Hong Kong authorities. It took until 1955 before court appointed Bailiffs managed to evict the remnants of the last of the ex-CNAC employees and fellow travellers-aligned with the regime in China. It is not clear who actually owned Bailey’s dockyard in the period after the initial CNAC purchase through to 1955 as the airline faded away once the aircraft had moved to America. Although now confined to Taiwan, possibly the nationalist government continued to own the dockyard via its past majority shareholding in CNAC?